Down in the industrial bloom of Seattle’s SODO neighborhood resides Sailor’s Rest, a small private studio operated by James van Leuven and John Atkins. 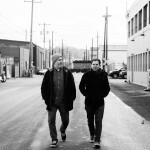 Like many of their musical peers from the fertile years of the ‘90s in the Northwest, Atkins and van Leuven transitioned from the tireless grind of endless local shows, econo tours, and dank rehearsal spaces to more carefully curated projects. For Atkins, this trajectory began with the turbulent, heart-on-sleeve trio Hush Harbor, segued into the landmark indie rock band 764-HERO, and eventually arrived at the adroit pop of The Magic Magicians and The Can’t See. For van Leuven, finding a creative space outside of dive bar stages and beer-soaked basements came more quickly, with the leap from serrated art-punk acts like The Sub Debs and Automaton Adventure Series leading directly to studio-centric projects like the beat-driven collages of his Plan B alias and scoring music for film and theater productions across the U.S. and Europe. These two trajectories finally crossed at Sailor’s Rest, where Atkins and van Leuven combine their skills under the name Sun Breaks. “John and I were both in-between projects and decided to get together in the studio to blow off some steam and have some fun just playing music,” van Leuven says of Sun Breaks’ modest beginnings. “From there we fell down the rabbit hole. We found that we’re a good match because our strengths are opposite—John’s singing, piano and guitars and my drums, synths, engineering and production.” Their debut self-titled EP was a gleefully strange and off-kilter affair, with Ethio-jazz-inspired rhythms, dubby outboard treatments, and the pensive melodies of Northwest indie rock culminating in a kaleidoscope of percolating percussion and dizzying soundscapes. On their debut full-length All on Camera, Sun Breaks push their merger of live instrumentation and electronic manipulations even further. The title track is a perfect demonstration of this fusion of approaches, with Atkin’s hazy vocals and van Leuven’s cyclical drum patterns, undulating banks of synths, and psychotropic production techniques recreating heady surrealism of The Beatles’ “Tomorrow Never Knows”. The restless angst that prompts many a young adult to pick up a guitar and recruit a few friends to bang out ragged tunes in a dark corner of an unfinished basement isn’t entirely absent from Sun Breaks’ current creative vision, but the nihilistic clamor and brutish instrumentation of punk has been replaced by the search for the light in the dark. “I think somehow all the weird prejudice and misinformation going on in the U.S. right now snuck its way into John’s lyrics,” van Leuven says. Atkins confirms this, but takes a new approach with his songwriting contributions. “One of the constraints I’ve tried to work within lyrically is to not be too negative,” he explains. “A lot of it is derived from the first stream of conscious vocal takes, a lot of the stuff deals with digital angst, pyschedellic surveillance and suburban childhood memories.” The result is lysergic, with both the positive and negative energy swirling in a cosmic tapestry of sound. 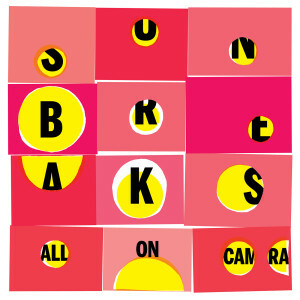 Suicide Squeeze Records is proud to offer Sun Breaks’ All on Camera to the world on October 26, 2018 on digital platforms and as a one-time pressing on translucent electric blue vinyl. This pressing is limited to 500 copies and includes a download card. IMAGES: To download, click above. Press photo credit to Chona Kasinger.